Once again, it was time to make a border run to renew our multi-entry visa before Jenny started her intensive six weeks of assisting on the Agama Tantra Initiation retreat. 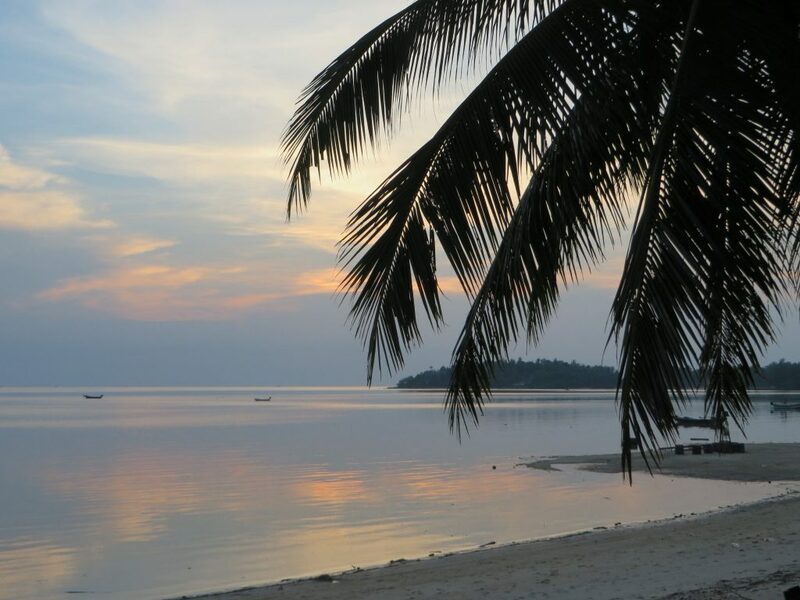 Leaving our beloved Koh Phangan yet again for the big city vibe of Kuala Lumpur. At least in KL, we can eat roti chennai, visit clean and spacious shopping malls, and see a movie in a real cinema. After a smooth, mostly enjoyable excursion, we returned to our island home. Hero was gradually getting used to being an only cat. He clearly missed Krishna, and he didn’t bounce around and play anywhere near as much. He also wanted more human attention. At this point, Ravi came down with a virus. He was running a fever, and all he wanted to do was lie down and rest. 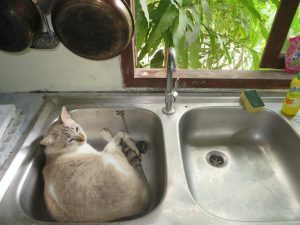 But May is the hottest month on Koh Phangan, and our little wooden house had no air conditioning. It was time for an emergency move. We figured that if we had air conditioning, we would save a lot of money by not going out and buying food and drink at airconditioned cafes. Plus, we could do counselling and Ro Tai sessions at home, and earn more money. We would also sublet our wooden house for a small profit. 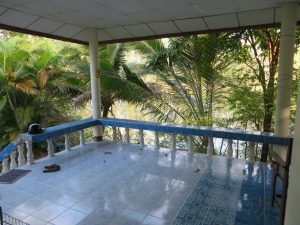 As it happened, one of the tightly-held lakeside houses we had hoped to rent the very first time we came to Koh Phangan was miraculously vacant! We moved using our backpacks and the motorcycle (a first for both of us!). And there we were – in a spacious concrete-and-tile bungalow by the lake! Just like that. With one minor problem – Hero had detected something amiss, and disappeared the day we moved. We went back to the old house every day, looking for him, and we showed pictures to all the neighbours. Finally, after three days, Ravi got a call from a neighbour – they had captured Hero. We quickly grabbed the cat carrier, and headed over to pick him up. He was thin and stressed, but otherwise well. And our little family was together again in our new house! 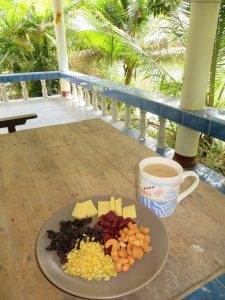 It wasn’t long until we had stocked up the kitchen, and were able to make quick and healthy meals and snacks. Although, with Jenny out at the ATI so much for the first six weeks, cooking at home got off to a slow start. Hero had a difficult adjustment. 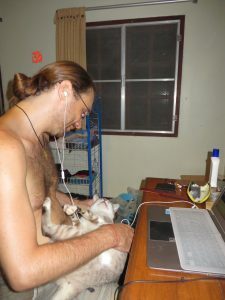 He enjoyed having the humans around so much more of the time, but the feline environment was less enjoyable. 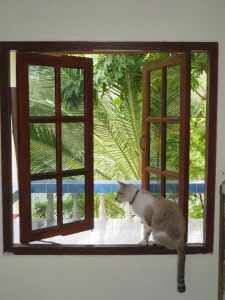 Previous occupants of the houses had left without taking their cats, a common practice on Koh Phangan, unfortunately. There were two hungry and aggressive cats who considered our kitchen their rightful property. We kept Hero in at night for a few days, and then tried leaving him outside for a night. Three screaming cat fights and one broken kitchen tap later, we realised that wasn’t going to work. Hero would be sleeping inside at night until he had sorted out the territorial boundaries. During the day, we would regularly hear cat swearing, and would come out to provide him with backup against the other cats. One day, Jenny heard cats swearing in the kitchen, and came in just in time to see Hero launch himself at an intruder (who was on the kitchen sink). Both of them disappeared out the window, and fell two metres onto the plumbing below. Hero sustained some damage, including a wound on his neck, which soon became infected. However, this incident shifted the balance of power, and the other cats came around less frequently after that. We had to remove Hero’s collar, because it was irritating the wound. We applied an anti-bacterial, anti-fungal, anti-inflammatory cream twice a day. After some time, we realised that one reason it was healing so slowly was that he kept scratching off the scab. Jenny fashioned a veterinary appliance from a Qatar Airlines business class sock, and Hero had less access to scratching the wound. He looked very suave, like a 1960s professor in a turtleneck. Eventually, after several weeks (and one and a half Qatar Airlines socks), the wound had healed enough that we could put his collar back on. 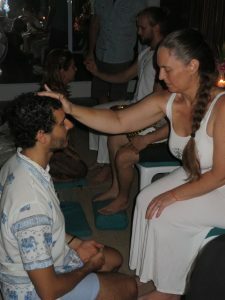 During this time, Jenny was busy assisting on the Agama Tantra Initiation, a six-week retreat. The first rule of the ATI is “don’t talk about the ATI”. The exact details of what is taught, and how the process works, are kept confidential. This is to protect incoming participants from developing expectations, and to allow participants the freedom to explore without their explorations being made public. We can divulge that there is a graduation ceremony, and this year Jenny (now known as Jnani) gave the blessing to the new initiates. The course is extremely intensive, and Jnani needed to rest up well before and after, to sustain the pace. We had to take another border run at the end of June, to make sure we re-entered Thailand just before our multi-entry visa expired. You get 60 days stay whenever you enter, even if it’s the last day of the six-month visa, and we were going to need that extra time.